The State of Warranty Chain Management. According to Pollock, “The 2019 survey results reflect all of the signals for an expanding market growth over at least the next 12 months, and probably beyond. Nearly two-thirds of respondent organizations are already running their services operations as profit centers with their own P&Ls, and annual warranty-related budgets are expected to increase-over-decline by a ratio of more than three-to-one. This has all of the makings for a fast-growing market. “Further, we are seeing an uptick in the percent of warranty services organizations taking steps to improve their respective planning and forecasting activities, and restructuring, as necessary, for improved warranty management oversight and accountability. The survey results also reveal that, presently, nearly two-thirds (62%) of respondent organizations expect their annual warranty budgets to increase over the next 12 months — with 21% expecting increases in excess of 10%. This is a significant improvement over the results derived from SFG’s 2018 WCM Survey. The respondents to the survey have also once again clearly identified the specific drivers that are pushing them to aspire to the attainment of higher levels of performance. 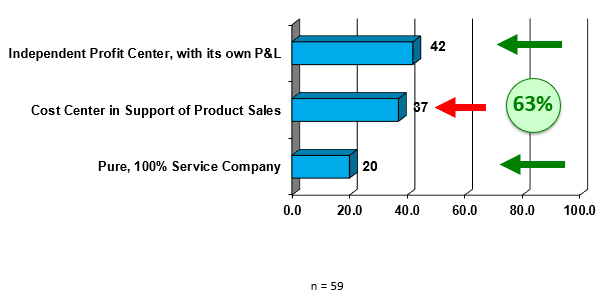 In fact, they have provided responses that solidify that there are still three main clusters of factors that drive their respective businesses: customer-focused, product quality-focused and profit-focused — and in that order (Figure 3). 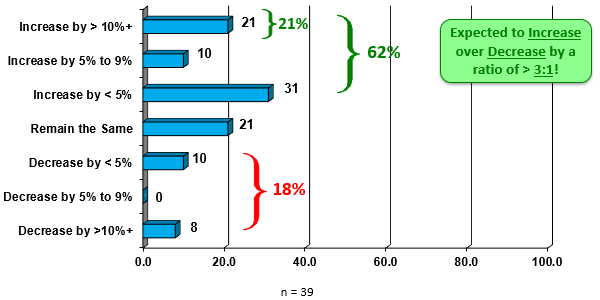 The next cluster of drivers is product quality-focused, and is represented by product defect-related costs (28%) and dealing with inferior/deficient product quality (23%). The third cluster, profit-focused, is represented solely by an internal mandate to drive increased service revenues (23%). 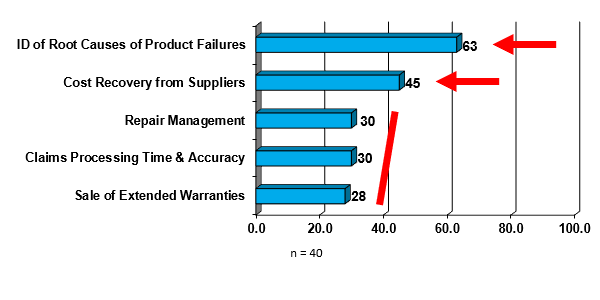 As such, the warranty chain management community has made it clear that it is squarely focused on, first, satisfying — and retaining — its customers; second, dedicated to improving product quality-related issues; and third, mandated to drive increased services profitability — again, in that specific order. 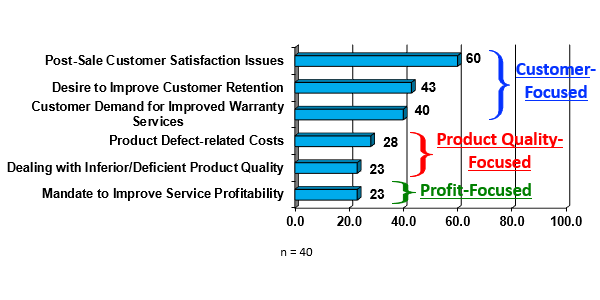 These results suggest a continuation of the relative normalcy that has characterized the warranty chain management segment over the past several years — that is, a return to focusing on customers, rather than spending most of their time and resources wrestling with cost reductions and other financial issues. Obviously, while financial considerations are still critically important, the industry focus has shifted back, as it always does, squarely on the customer’s needs, requirements, preferences and expectations. Based on the 2019 survey results, Pollock suggests that, “the greatest challenges facing warranty services managers today align closely with the key market drivers, as well as with the current and planned strategic actions to be taken.” As a result, these data continue to reflect an environment where overall improvements are likely to transpire in the next 12 months, thereby leading to higher levels of customer satisfaction and the further stimulation of financial growth for the segment. Bill Pollock is President & Principal Consulting Analyst at Strategies For Growth (SFG), the independent research analyst and services consulting firm he founded in 1992. Previously, Bill served as President & Chief Research Officer (CRO) at The Service Council; Vice President, Principal Analyst, heading up Aberdeen Group’s Service Management Practice; and Managing Analyst, Services Industry at Gartner. In 2015-17, Bill was named “One of the Twenty Most Influential People in Field Service” by Field Service News (UK); One of the “Top 10 People Every Field Service Pro Should Follow” by Field Service Digital; one of Capterra’s “20 Excellent Field Service Twitter Accounts”; and one of Coresystems’ “Top 10 Field Service Influencers to Follow”. He writes monthly features for Field Service Digital, Field Service News, Field Technologies, and Future of Field Service, and is a regular contributor to Warranty Week. Bill may be reached at +1 (610) 399-9717, or via email at wkp@s4growth.com. Bill’s blog is accessible @PollockOnService and via Twitter @SFGOnService.